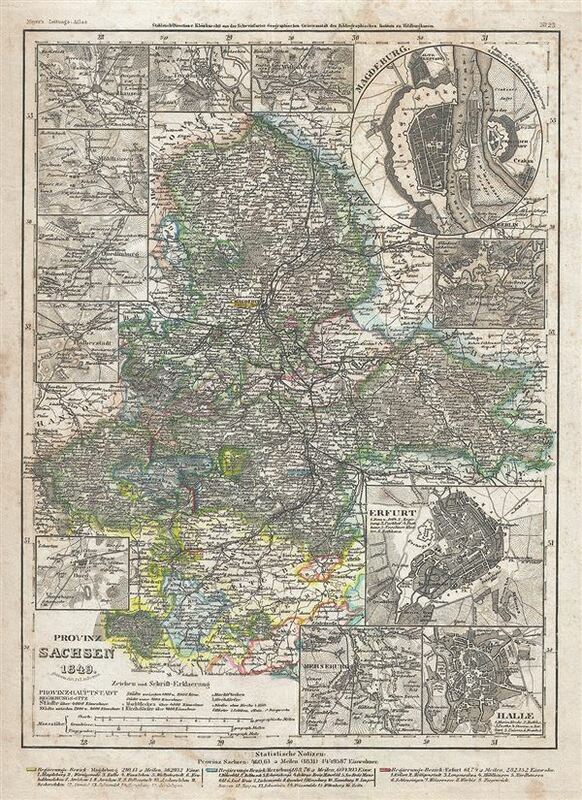 This is a fine 1849 map of the Province of Saxony by Joseph Meyer. It covers the former Prussian province from Hansestadt salzwedel south to Eisfeld, covering most of the modern German states of Saxony-Anhalt and Thuringia. Throughout the map identifies various cities, towns, rivers and an assortment of additional topographical details. Twelve insets detailing Magdeburg, Naumburg, Erfurt, Halle (Saale), Merseburg, Burg, Halberstadt, Quedlinburg, Muhlhausen, Nordhausen, Torgau and Wittenberg are included. The Province of Saxony was established in 1816 following the Napoleonic Wars as a province of the Kingdom of Prussia and later the Free State of Prussia and was considered one of the richest regions in Prussia. It was disestablished in 1945 and most of the region eventually became the modern day state of Saxony –Anhalt. This map was issued as plate no. 23 in Meyer's Zeitung Atlas. Although all the maps in this atlas are not individually dated, the title page and maps were often updated while the imprint with the date was not, causing confusion to the exact date for some of the maps. Moreover some maps in the atlas were taped in at a later date as an update to the atlas. We have dated the maps in this collection to the best of our ability. Good. Toning and some foxing throughout. Dampstain along left margin.